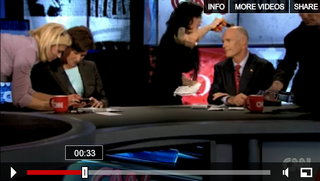 Click to viewFlorida's gubernatorial race has been too tight to call, which is why CNN brought the two candidates on for a debate last night. During which Democrat Alex Sink was busted, on camera, for receiving an illicit text from her campaign. "The attorney who [w]on the Sykes suit said alex sink did nothing wrong. Tell not to let him keep talking about her." Outside interference—especially in the form of advice from your campaign team—was a big no-no, explicitly prohibited in the rules agreed on by both sides. And Sink managed to do it in plain sight of her opponent, Rick Scott.